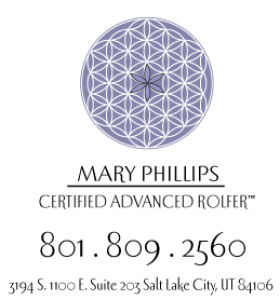 Contact me online via my website at www.rolfingslc.com, or my direct email is mary@rolfingslc.com, or you can call me at 801-809-2560. Sessions cost $120, you can expect each session to last between 60 to 75 minutes. Major credit cards, cash and checks are accepted. Yes, some insurance may cover your appointment, including insurance from an auto accident. Please call for more details. A 24 hour notice of a cancellation or reschedule is required to ensure that you will not be charged for a missed appointment. You will be charged $60 a session for a cancelled or rescheduled appointment with less than 24 hours. The confidentiality of communication between a client and a therapist is important. Every effort is made to keep information regarding your session confidential, as is required by law.